On February 17, 1888 architect Auguste Namur filed plans for a "six-story brick warehouse" to be built at No. 77 White Street for developer John M. Dowd. Projected to cost the equivalent of just under a million dollars today, it would replace a brick store, which had no doubt replaced a brick or frame dwelling. Dowd, who was well-known in real estate circles, had chosen an architect with an unusually fascinating past. Pierre Auguste Namur was born in Luxembourg in 1837 and graduated as an engineer from the Ecole Centrale des Arts et Manufactures in Paris in 1855. His work as an engineer was interrupted by the Franco-Prussian War. According to a family member later, he was captured and sentenced to ten years of hard labor by the French. Rescued by the Germans, he escaped to America in 1873. In America it does not appear that he ever used his first name. After working as a civil engineer for several years, he was listed as an architect in 1879. His design for Dowd's utilitarian structure on White Street would be in some ways as interesting as his path to getting here. Completed within a year, No. 77 White Street stretches 100 feet along Cortlandt Alley. Faced in red brick and sparsely trimmed in limestone, the alley elevation is industrial and purposely without much interest. The White Street facade, which wraps around the corner the length of one bay, is a neat and reserved melding of current styles. Each of the upper three floors are separated by stepped brick bandcourses capped with stone and the paired openings sit within segmental arches. The minimal decoration is reserved to slightly projecting brick panels of saw-tooth brick at the third and sixth floors, and an attractive brick-corbelled cornice. Nothing about the design was remarkable--except the cast iron storefront. Namur gave the pilasters and piers incised line decorations so popular in Eastlake furniture designs at the time. The anthemia which made up the capitals were an equally-important element in Eastlake and neo-Grec design. But one step above Namur tossed convention and current fashion aside. The exposed rivet heads were brashly unconventional in 1888. The entablature of the storefront is an undisguised I-beam. Other than the decorative rosettes, the architect left the framing's function naked and exposed. Rivet heads, never seen in Victorian structures other than bridges and railway trestles, proudly act as design elements. In was the 1888 version of industrial-chic. The building was leased to Sweeter, Pembrook & Co., dry goods merchants. The firm was no doubt highly disheartened when Mayor Hugh J. Grant shot down its request to erect a bridge between No. 77 White Street and No. 378 Broadway shortly after moving in. Although the Board of Aldermen approved the request on October 15, 1889, the Mayor vetoed it two weeks later. His October 29 letter to the Board said in part "The street over which it is proposed to build the bridge is already narrow and dark, and a structure of the kind proposed by the resolution would not fail to render it more so." Despite the disappointment, Sweeter, Pembrook & Co. remained at No. 77 White Street through 1904, when it liquidated. The Great Bargain Sale, as it was known, caused excitement for retailers throughout the country. After making renovations Morgenstern & Goldsmith took over the building in January 1906. 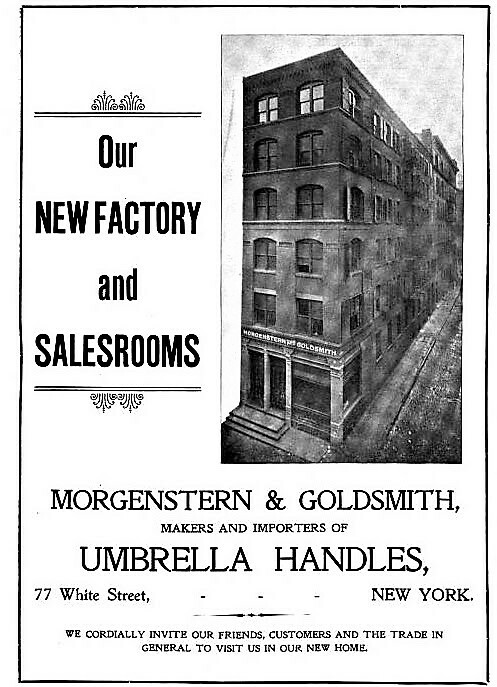 Founded by Hans Morgenstern and Eugene J. Goldsmith in 1891, the firm imported and manufactured "umbrella and parasol fittings, walking canes, etc." The firm not only purchased handles abroad, but manufactured their own on site. 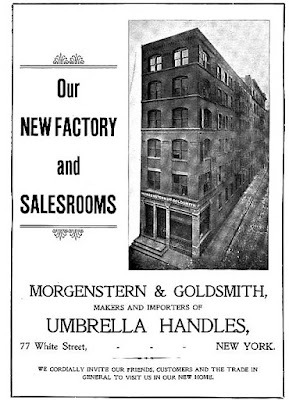 The trade magazine Trunks, Leather Goods and Umbrellas described the broad array Morgenstern & Goldsmith put on display in their new showroom in February 1906. The entire collection is fully up to the standard of quality and novelty for which this house has earned a leading position in the American market. Among the finer grades, especial attention has been given to the new effects in burnt ivories with many novel designs and attractive features. The article noted that "There are also a variety of styles in all the popular woods, plain and German silver trimmed horns, and other novelties made in the new factory." Businessmen within the industry may have been shocked when The Sun reported on April 4, 1911 that a creditors' petition in bankruptcy had been filed against Morgenstern & Goldsmith. The newspaper reported their assets at $20,000 with liabilities at $44,000. No. 77 was home to a succession of tenants through the next few decades, including the Carpenter-Kerlin Gear and Machine Co. There were two tenants in the building when the Estate of John M. Dowd sold it to David S. Meister in March 1946. In May 1952 it was purchased by Weiner & Bauer, textile merchants. The firm continued to operate from 374-378 Broadway (the same building Sweeter, Pembrook & Co. had hoped to connect by a bridge 54 years earlier) and used the upper floors of the White Street building for warehousing. It leased the store to the Reem Paper Corporation. Three years later Reem Paper Corporation purchased the property from its landlord. On March 26, 1955 The New York Times noted "The buyer plans in time to use the entire building." Although the metal Reem Paper sign still hung on the building in 1978, it was not the selling of paper products that was going on in the ground floor space. That year art curator Diego Cortez and Anya Phillips, a visible presence in the downtown club scene, convinced East Village resident Steve Maas to open a punk club in the space. The pair had come up with the name Molotov Cocktail Lounge; but since Maas was money behind the project, he named it the Mudd Club--a reference to Dr. Samuel Alexander Mudd, the doctor who treated John Wilkes Booth following the assassination of Abraham Lincoln. It opened on Halloween night 1978 with a party for Punk magazine. The off-beat club was soon a haunt for cult celebrities. The following April Suzanne Sleisin, writing in The New York Times, remarked "It's not a place that one simply happens upon...the Mudd Club is practically invisible on the ground floor of an anonymous loft building. but it has emerged as the latest watering hole for some of the city's night people." Sleisin wrote "The lighting at the Mudd is subtle--'dark' was how Gerald sussman, an editor at the National Lampoon, preferred to describe it. Back from a rigorous time on the dance floor, he said, 'I can't see a thing. Why I was dancing with a giant zucchini for four minutes before it knew it.'" The drummer of the Talking Heads, Chris Frantz, told the report he came about three times a week. The live entertainment was as diverse as the patronage. "One Sunday night the club gave a pajama part, and Taylor Meade read dirty poetry," said Sleisin, "another night Nico, formerly of Andy Warhol's Velvet Underground, sang." That same month People Magazine wrote "New York's fly-by-night crowd of punks, posers and the ultra-hip has discovered new turf on which to flaunt its manic chin. It's is the Mudd Club." On any given night a celebrity like Grace Jones or David Bowie might be spotted among the crowd. The Mudd Club closed in 1983. The space became home to a much less flashy tenant, B. L. Frames, Inc. Today the space is vacant, while the upper floors were converted to apartments--just one per floor--in 2006. And through it all Auguste Namur's remarkable storefront has survived virtually intact.